With up to 80 fire pits blazing along the reflecting waters of the Providence, Woonasquatucket, and Moshassuck rivers which conjoin in downtown Providence, your family will delight in watching Rhode Island’s famous WaterFire spectacle, which encompasses nearly a mile of illuminated space and provides mystifying entertainment. Inspired by artist Barnaby Evans, who created the first fire sculpture in 1994 as way of celebrating the 10th anniversary of the First Night Providence, WaterFire is a non-profit arts organization that celebrates Providence by bringing people together for the lighting of torch bonfires along the river. On WaterFire nights, people of all ages can enjoy the mystical beauty of the burning fires that adorn and illuminate the river. The festival is a captivating ritualistic-like ceremony with tribal vibes, drums and exotic costumes that are sure to keep even your youngest family members awake. Music plays throughout the night. The music varies from religious songs and spiritual hymns to natural tones; all of it is chosen to accompany the spirit of the the festival. Residents and visitors alike walk along the river bank, breathing in the cedar aromas released by the burning logs, and enjoy the many artists and interesting entertainment. You can even take a boat tour or gondola ride past the flames if you’re feeling adventurous. And all will delight in the sight of professional torch handlers who float in the river and elaborately create the vision of dancing flames. 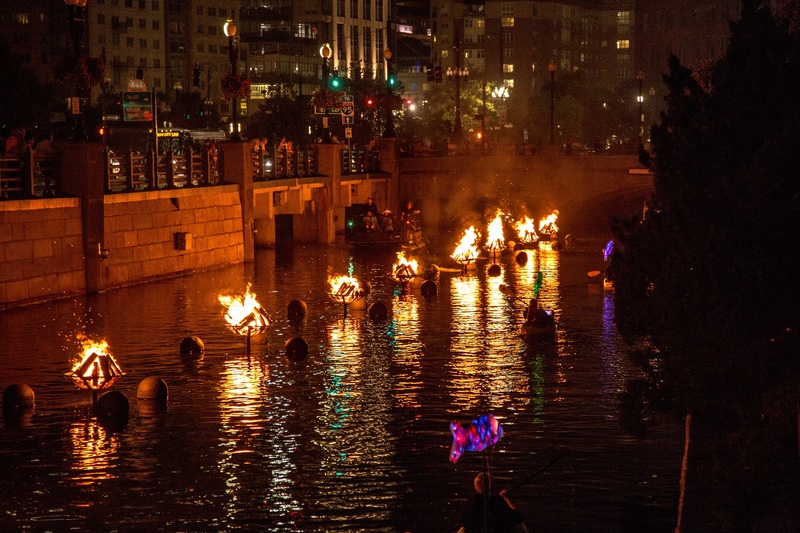 WaterFire may be held on a few holiday weekends year round, but you can count on one or two Saturday or Sunday nights each month, May through November. The festival has steadily expanded and now attracts thousands of people to each event; decreased funding, however, has meant that there are “full” and “basin” lightings on different nights supported by sponsors. Full nights mean you’ll get to see 80 braziers from Waterplace Park to Memorial/South Main Street Park. Basin lightings feature 22 braziers in the Waterplace Park Basin; partial lightings take place along Providence Place Mall to Steeple Street. WaterFire is a perfect after-dinner activity, as it starts at sunset and lasts till 12:30am. And if you’re trying to stick to a budget, WaterFire is free –- donations are welcomed to support the arts. If you’re going to stay in Providence for awhile, get in touch about helping out with the night’s event with volunteer options for the whole family. Take a stroll along the river (folding chairs are not permitted near the fires) and embrace this community experience with your family. See the updated schedule of WaterFire events on the WaterFire website. Providence offers a handful of hotels and inns to accommodate you and your family during the festival. Be sure to look for package deals and book at least a few months in advance. Here are some of the hotels that are best for families traveling with younger children. The contemporary Providence Marriott Downtown is located in the heart of Providence and offers a great WaterFire package which includes breakfast for two, as well as other discounts on local dining options and attractions. One of the city’s top luxury hotels, it has its own spa, and indoor/outdoor pool, fitness center, business center, offers free parking, free Wifi and is pet-friendly. This hotel offers a handful of deals including a family package with zoo tickets and a museum visit for those staying longer to sightsee in this family-friendly town. The Providence Hotel, a 19th century building with historic charm, also provdies valet, concierge, laundry, and a fitness center, among a few of their amenities. Located in the historic financial district of the city, the red brick Hampton Inn has more than 100 guest rooms, free WiFi, a fitness center and a free hot breakfast for all guests. Cribs, high chairs and playpens are available on loan. This boutique style hotel offers waterfront views, perfect for your stay during WaterFire. Near Brown University and WaterPlace Park, and just a short walk from the train station, this moderately-priced hotel is close to a number of Providence attractions. Whether you’re bringing your teens or little ones, the fitness center, indoor pool and hot tub are sure to make them happy. Find out more information on hotel deals and packages at the tourist office’s Go Providence site.